When it’s time to start considering new living arrangements, either for yourself or for a loved one, it can be challenging to know which options are best. Plenteous options mean you’re spoiled for choice, but trying to determine what each offers can be overwhelming. The difference between assisted and independent living facilities is particularly confusing since many of their services overlap and some communities offer the ability to “age in place” with both independent and assisted living services available to all residents. In this post, we’ll dive into what’s similar between the two as well as the key differences that will help you make a good decision for yourself or your loved one. Seniors enjoy a spectrum of choices designed to meet their precise needs: independent living, assisted living, memory care, and skilled nursing. You’ll also find other options like short-term respite care, which offers a range of services for temporary use (like light assistance for recovery from a hospital stay, or higher levels of help for when a caregiver takes a vacation or has to go out of town). The level of care is the primary difference between each option you’ll find in senior living arrangements. Some communities offer a continuum of care, so there is no need to uproot when care needs change. Rather than having to relocate, the community can adapt the care services and your loved one can remain in the home they have created. Be sure to ask a community you are considering what level of care they can meet in a given apartment and at what point your loved one would have to change areas of the community or find a different community altogether. Couples can especially benefit from communities that offer a continuum of care since a spouse requiring a lower level of care can continue to live with or easily visit the spouse requiring a higher level of care. What is Independent Care and How is it Similar to Assisted Living? On the spectrum of care, independent living offers the least support, and assisted living offers a range of services in addition to those provided in independent living. Imagine the spectrum of care on a line going from left to right, with the options offering non-medical care services like housekeeping and meals on the left and acute medical care like a hospital or rehabilitative stays on the right. Independent living would sit on the far left of the line, and assisted living would come immediately after. Assisted living covers a range of additional medical and non-medical services but shares all of the basic offerings of independent living. The goal of both independent and assisted living is the same: to offer residents the most independence possible while providing enough assistance and interaction to keep them healthy, happy, and safe. Both options provide individual apartments in a close-knit community of other seniors where services like housekeeping, meal preparation, and even laundry can be provided. There are coordinated outings, activities, and events available and catered to any ability level. The goal of these programs is to keep the most active and the most in need resident equally challenged and entertained. Both settings usually provide transportation services for those who can’t or don’t wish to drive themselves. The included services will vary from community to community. 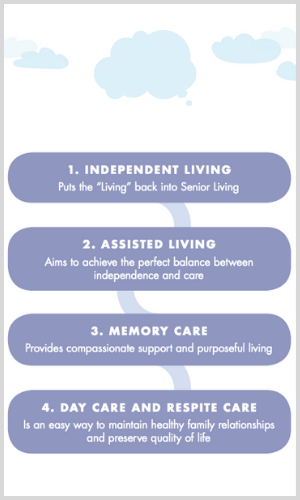 What is the Difference Between Assisted Living and Independent Living Facilities? Despite the similarities, however, there are important differences between assisted living and independent living facilities. Here’s what you need to know. The main goal of the services available at independent living communities is to make life a little easier for residents. Landscaping and home maintenance are always included. As previously mentioned, these communities also organize a variety of activities and events for residents to enjoy, and they plan trips. Most independent living communities also offer optional cleaning services, onsite dining, and/or meal delivery services. They don’t offer medical care or assistance with personal care. Assisted living communities provide additional services for those whose who might need extra help. Staff is nearby and available to help with personal care tasks like taking medication, bathing, and dressing. Nurses are on call and available for residents to access at any time. However, advanced medical care such as skilled nursing isn’t offered. This type of community is not designed for those with major health impairments. Independent living communities offer the widest range of living space options. Single-family homes, duplex cottages, and condos are all available. These residences are similar to those you’d find in any community, with the key difference being that they’re located in an independent living community with landscaping and home maintenance provided. They’re also typically located around a central building where residents can access staff, take meals, enjoy events and activities, and take advantage of amenities like computer rooms, swimming pools, even gardens and atriums. In an assisted living community, because residents need greater access to staff and services, living space is typically in the form of apartments. Many are equipped with full kitchens, although not all. Because independent living communities are designed for those who are the most independent, staff (including licensed nurses) are available but may not be in the immediate vicinity. Residents can call the office for assistance or visit staff in the central building. Assisted living communities maintain staff that are close at hand. Staff frequently check with residents to see if they need anything, and they provide monitoring as required. In assisted living communities, staff are located in the same building as the resident and can be there with help quickly. With independent living, your required expenses are typically limited to a joining fee and rent. You may opt for additional services such as meals and laundry. As you might expect, the higher level of service that comes with assisted living also comes at a higher cost. Meals, housekeeping, and increased access to staff are included in the base price that’s required to live in an assisted living community. But because assisted living is considered necessary and not a living preference like independent living, long-term care insurance covers at least a portion of the cost. Ultimately, the choice rests on the needs of you or your loved one. The guidelines below will help you evaluate those needs and better understand how the difference between assisted living and independent living facilities may affect your decision. You seek out activities that involve other people. You’re relying on a family member to run errands for you on a regular basis. You have difficulty taking care of everyday tasks like cooking and cleaning. You find yourself falling more often. Your doctor has shared concerns for your health when you’re alone at home. You have received a significant medical diagnosis. Also, consider the future. What does the trajectory of your health look like? A community that offers both independent living and assisted living makes the transition simple when the time comes. The best way to find information about the community you’re considering is to arrange a tour. This gives you the opportunity to ask questions of staff and residents and see the community firsthand. If you’re looking for an independent or assisted living in Tacoma, Washington, we would love to give you a tour of Weatherly Inn. We offer independent and assisted living as well as memory care and respite care. Schedule a tour of Weatherly Inn!